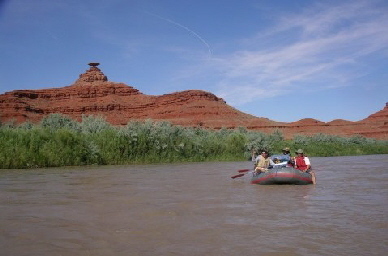 Cruising the canyons in Utah by whitewater raft is one way to get away from it all. It's an adventure that encompasses lots of activities that will long be remembered. Our recent week-long trip to southern Utah offered the perfect combination of sightseeing, relaxation, camping and wilderness adventure. We climbed into ancient Indian cliff dwellings, viewed petroglyphs, hiked to waterfalls and splashed around in rapids on rafts and inflatable kayaks. We decided to join friends Dave and Peggy Arnold and their 5-year-old son Jeffrey on a 4-day whitewater rafting trip on the San Juan River. Dave is part owner of Class VI River Runners in West Virginia and we figured he would know a good whitewater trip. We were not disappointed. If you were flying into Utah for this trip, you would fly into St. George and then take a 6-hour drive to Blanding. There are two roads leading to Blanding, one on the north of Canyon National Recreation Area, one on the south. We decided to take the southern route on the way to Blanding and return via the northern route. We discovered that the southern route is the most desolate, running mostly through Indian reservations, and that the northern route goes through some unforgettable scenery. Our rafting trip started out early in the morning, and soon, we discovered that we were mostly unprepared for the extreme heat. At over 105 degrees in the dry desert heat, drinking water and frequent jumps in the cold river were the only way to stay relatively comfortable. Even for us Floridians, the heat took us by surprise. The group consisted of a family of 13, the Arnolds, a couple from California and us. Three large rafts and one paddle raft easily accommodated us. In addition, inflatable kayaks or rubber "duckies" provided additional fun, entertainment and paddling options. The four guides , all in their 20's and 30's, were relatively familiar with the river but none had been on this route more than half a dozen times. The leader guide, Angie, kept a tight rein on operations and was well organized. Kevin, Heather and Jan all had great personalities and worked hard to show us a good time. On our first float day, we saw one of the most interesting sights of the entire trip – ancient petroglyphs carved on the side of a cliff. In amazingly good condition, the group learned about the origins of these petroglyphs. Their location high on the side of the cliff allowed for easy photographing. 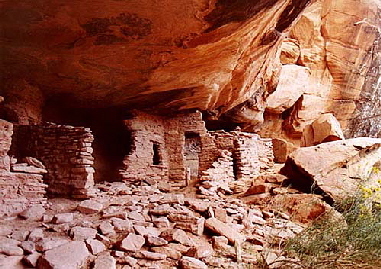 That afternoon, we stopped for lunch at another very interesting site – ancient pueblo cliff dwellings. Even in the heat of the day, it was easy to see that these dwellings would have remained at very comfortable temperatures. Built into the mouth of a large cave, it is surmised that the ancient inhabitants grew maize (corn) and other vegetables in the flats below and that the river was closer to the cliffs, making irrigation a little easier. We carefully explored the fragile buildings and made sure to leave only footprints. Late that afternoon we arrived at our first campsite – the temperature was still extremely hot and we learned that pitching your tent on hot sand in the heat of the day trapped much of it, to be radiated back from the ground that evening. There was little shade to protect the campsite until the sun set behind the canyon walls. However, the food was excellent and unbelievably tasty. And after a cold bath in the river to wash off the sunscreen and dust, things always seemed much better! Not surprisingly, the skies were unbelievably clear both during the day and at night. The sharp blue sky, unhampered by pollution or humidity, was perhaps the most vivid blue color we had noticed in many years. Contrasting with the red hues of the canyon walls, it was obvious how Indian art still reflects the actual colors of their lives. At night, the light of the stars almost made it possible to walk in the dark. A satellite streaked across the sky, easily visible. It wasn't long before the group realized that wearing long sleeves and pants during the day was smarter than shorts and sleeveless shirts. No amount of sunscreen could keep anyone from getting sunburned to a point, especially since we kept jumping in the water to either cool off or get rid of all the water we had to drink to stay hydrated. There were several interesting hikes during our rafting trip, including one up the side of a cliff to a prospector cabin built in 1894. Lacking only the roof, the cabin is perched overlooking both sides of a u-shape turn in the river. It was unimaginable how anyone could survive in that heat, with little food. We saw a few wild animals along the river, including about 15 or 20 big horn sheep, some Canada geese and a deer, not the easiest of prey for any hunter. We also hiked into Slickhorn Gulch, one of the premier side canyons along the Colorado System with fern grottos and swimming pools. This turned to be a popular site visited by several river-rafting groups simultaneously. 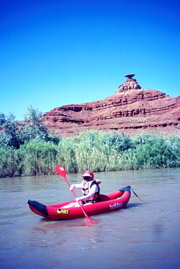 Another interesting rock formation was Mexican Hat - a rock perched atop a hill and a popular photo spot. One of the most enjoyable ways of rafting the San Juan turned out to be the rubber "duckies ." Shaped like kayaks, the small inflatables were easy to navigate, kept you very cool as the water occasionally splashed inside, and provided some privacy and quiet away from the group. Running the small rapids found along the way was exciting, as several of the younger guys did repeatedly. Even 5-year-old Jeffrey, the youngest in the group, easily mastered the technique under the watchful eyes of his father and mother. To Jeffrey's disappointment, he was not scheduled to take his duckie through "Government Rapid," considered a class 3 whitewater rapid. However, the swift-running river had other plans and it caught everyone by surprise. All of a sudden, the duckies that were supposed to stop were unable to divert to shore and continued on through – to Peggy's dismay. Jeffrey thought nothing of it and was soon seen smiling as he perfectly paddled through with father Dave right behind. I'm sure that it was the best day of the trip for that young man! We were glad that we had selected a trip where we knew someone. Especially with a family of 13 people, it was easy to get excluded from conversations and activities. If we had to do it over again, we would schedule the trip earlier or later in the season when the heat may not be as extreme, even if the nights are colder. We would also read up on the area prior to the trip, which would have given us greater insight into the history, geology and geography of our experience. After the four-day trip we said good-bye to our friends and took the northern route towards St. George. We had only one day to visit Bryce Canyon and Zion along the way, and we wanted to maximize our time. This was a much more scenic route, taking us through Capitol Reef National Park and other recreation areas in southern Utah. The visitor center at Bryce Canyon was under renovation, but we managed to view the 20-minute film (recommended) and see the displays. We stopped at several scenic spots, including Bryce Point, Natural Bridge, Inspiration Point, Sunset Point and Sunrise Point. Each of them provided breathtaking vistas of the canyon's vertical cliffs that typify the southerly Paunsaugunt Plateau. Informative signs easily described the fantastic views and natural formations before us. Bryce Canyon should not be missed by anyone traveling to the Western United States! It would have been very easy to extend our two-hour visit in Bryce, but we knew we also wanted to see Zion. A geologist's paradise, Zion includes desert swamp, a petrified forest, waterfalls and rock patterns that only nature could design. A new shuttle system has eliminated the traffic jams that occurred during the popular April through October season. The free shuttle takes 90 minutes on a round trip of Zion Canyon Scenic Drive, which includes the visitor center, the museum, Court of the Patriarchs, the Zion Lodge, the Grotto, Weeping Rock and the Temple of Sinawava. Along the route, we discovered climbers halfway up Refrigerator Canyon, looking like tiny specs of dirt on the side of the rock. From our bus, we noticed deer and turkey grazing in the park, oblivious to the busload of tourists motoring by. Zion is most definitely a place to come to in the off season, and certainly offers hikers and primitive campers multiple options. The comprehensive visitors center has extremely detailed books on each of the hikes and camping trails, labeled from easy to strenuous. Most interestingly, the welcome center building was designed to be cooled and heated without any electricity. In only 7 days in southern Utah, we managed to cram a lot of activity and scenery. More time for everything would have been ideal, but even in just a few hours, it's impressive and well worth it. We want to go back to the beautiful canyon country someday. For Information on this great San Juan River raft trip, contact Holiday Expeditions through their website at www.bikeraft.com or phone 435-564-3273.